People often assume that drastic, unexpected dangers to their houses have no chance of happening. Unfortunately, many people find this expectation gravely disappointed when natural disasters strike their neighborhoods abruptly. All homeowners need to take steps to prepare for dangerous weather because it can—and often does—strike here in North Carolina. The state annually experiences many natural disasters, including hurricanes, tornadoes, and floods. Here are useful pieces of advice for homeowners to prepare their families for natural disasters. During the busy and eventful summer season, it is especially easy to get caught up in your life and neglect home safety. Parents may ask: “Why devote so much time and energy to prepare for a natural disaster which is unlikely to even happen?” Well, the first thing to point out is that it is much easier to prepare your family for an emergency than it is to keep them safe without having taken any precautions. More importantly, a natural disaster is not as unlikely as you might think—especially in North Carolina. According to a recent study, the state ranks fifth in the country for the number of homes that are at high risk or very-high risk of natural disasters. To make matters even worse, they can strike during each season. 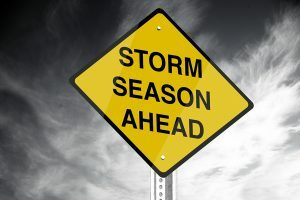 Summers in North Carolina are prone to hurricanes, and the start of hurricane season was June 1st, so there is no better time to prepare yourself. Tornadoes can strike at any time, with the peak of the state’s tornado season being in the Spring. Winters often experience snowstorms, icy roads, and power outages. Finally, the Fall can experience anything from flooding to wildfires. Thankfully, the situation for North Carolina homeowners is not at all hopeless! There are many courses of action which families can take to prepare themselves for natural disasters. Obviously, one of the first steps which you should take is to know what you most need to prepare for by discovering which natural disasters are most liable to strike your neighborhood. It may be wise to ask your neighbors what kind of inclement weather happens in the county most often and do private research online. After taking into account the peculiar weather of your area, you can begin to prepare. Assembling an emergency supply kit can mean the difference between a very dangerous situation and a safe one after a disaster strikes. Include in your kit a gallon of water and a three-day supply of non-perishable food. Canned foods would be a good option, but if you opt for them be sure to include a manual can opener. Other supplies, such as fire extinguishers, first aid kits, and blankets can also keep your family safe in the event of home damage and extended power outages. Be sure not to forget items specific to your own personal family needs, such as food for your pets and baby supplies. Keep everyone in your family informed about the proper course of action and place to go in the event of a disaster. During disasters such as tornadoes and hurricanes, windowless rooms low to the ground, such as underground shelters, basements, or bathrooms, are the best option. Since 1990, the U.S. government has announced 20 federal disaster declarations for tropical storms and flooding in North Carolina. Many areas of the state experience frequent tornadoes—with Hoke, Cumberland, and Robeson counties featuring in the nation’s top 100 at-risk counties. Winter weather frequently leaves tens of thousands of people across the state without power for days and imperils your ability to travel. Far from being an unnecessary chore, taking the proper precautions to keep your family safe is one of the most useful things that you can do for them. As North Carolina begins Hurricane Season, take action to prevent the worst-case scenario from becoming your new reality. For disaster resources, please see this current list of Red Cross, government and other officials apps and websites.